The small island known as Chinaman’s Hat has tons of adventurous activities. For some reason though, this little gem manages to swoop under the radar of locals and tourists alike. Chinaman’s Hat, officially known as Mokoli’i, is a very small island off of the East coast of Oahu. It is called Chinaman’s Hat by locals because of its shape. It’s traditional name, Mokoli’i, means “little lizard” in Hawaiian, because of an ancient Hawaiian legend. As the legend goes, Pele (the Hawaiian fire goddess) had a sister named Hi’iaka, who came to visit the Kualoa area on the East side of Oahu. While she was there, she came across a large, angry lizard (in some versions, it’s a dragon). Hi’iaka fought the lizard and chopped off its tail. The lizard flopped to the ground, so its body created the Kualoa Mountains, and its tail flew a few hundred meters away and created the island of Mokoli’i. Before I get into all of the adventurous activities on the island, there are a couple of safety concerns that need to be addressed first. Because this is an island with absolutely no accommodations of any sort (and no space for camping if that thought even crossed your mind), you must make it back to the main island of Oahu both before dark and before high tide. Therefore, it is extremely important to check the times that the tide change before you go on any of your Chinaman’s Hat adventures. This website updates the tide predictions around the area of Chinaman’s Hat. So What Can I Do On Chinaman’s Hat? Honestly, most people don’t go beyond a few pretty pictures with the island in the background (and don’t get me wrong, it looks stunning in photos). But there is so much more that the island has to offer! Before you do any activities on Chinaman’s Hat, you have to actually get to Chinaman’s Hat. While it is possible to walk there from Kualoa Regional Beach Park, it is very much not recommended. In addition to the changing of the tides, there are also many sharp rocks and pieces of coral that can scratch up your feet. Instead, I recommend kayaking or stand up paddle boarding to the island. 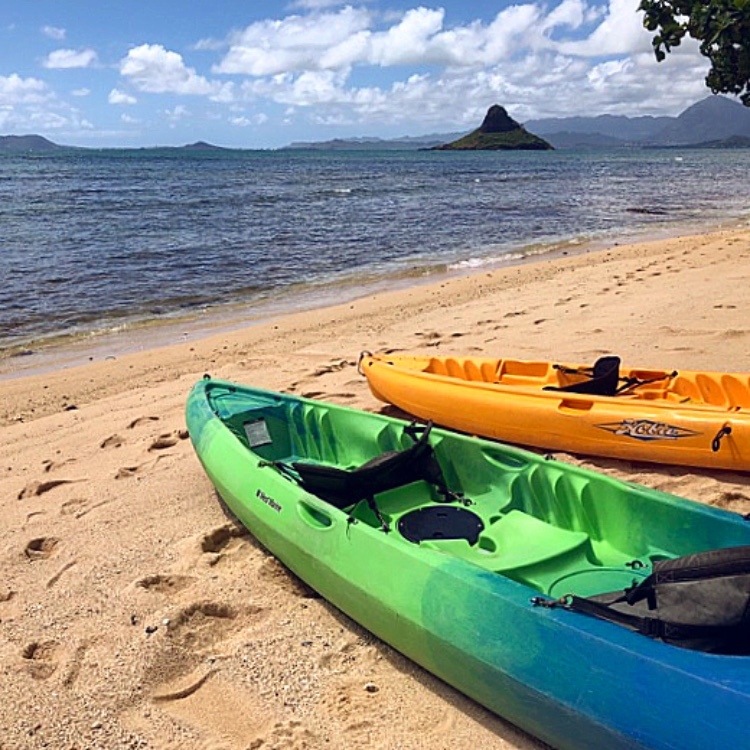 The hardest part of kayaking or stand up paddle boarding to Chinaman’s Hat is acquiring the kayak or the paddle board. If you have the gear and a car with a rack, load ‘em up. If not, there are a couple places that will deliver kayaks and paddle boards to a destination and pick them up from a destination, like Hawaii Beach Time and Active Oahu Tours. They may even provide complimentary life vests if you’d like. While some start at Kualoa Regional Beach Park, an alternative is to start at a small, unnamed beach directly across from the entrance of Kualoa Ranch. I recommend the second option, because you will not be going directly against the current either on your way there or the way back. (Plus, there’s a hidden little beach swing there!) With the first option (Kualoa Regional Beach Park), you will be going directly against the current on the way back (as the current pulls slightly outward). The paddle itself is not too difficult, and the waves at low tide do not get too large. (Do be careful if you find yourself in the water as the tide is rising.) 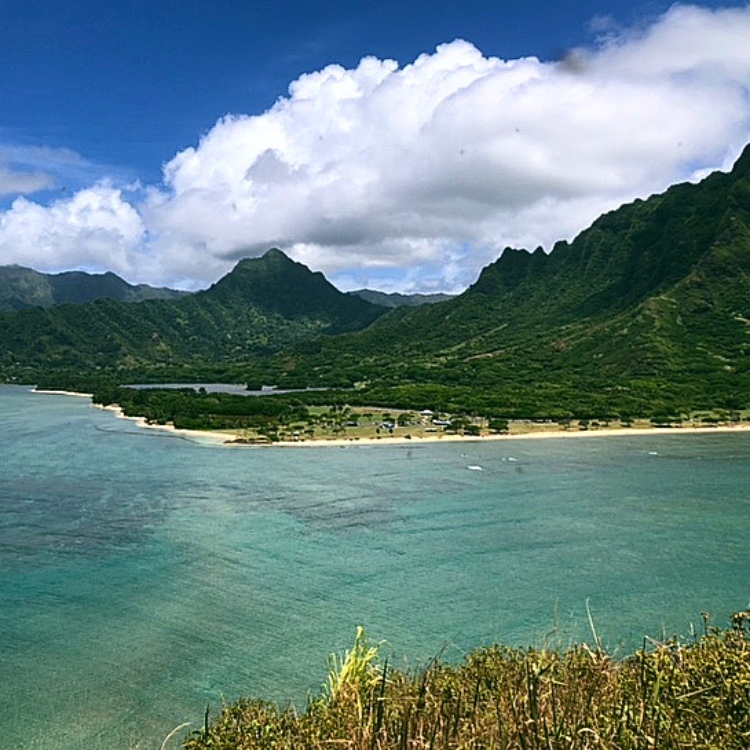 Land your boat at the tip of the island closest to Kualoa Regional Beach Park (the western-most tip). There will be a very small beach for you to pull your gear up onto. There are many, many beaches on the island of Oahu, and you can swim at most of them. However, swimming at Chinaman’s Hat is a one-of-a-kind experience. You know that perfect teal color of the water at Kailua Beach and Lanikai Beach that has made them basically Instagram famous? Well, that color is at Chinaman’s Hat too. (I mean, it’s only a few miles down the road). And there aren’t any people. There was literally no one else in the ocean but us. *Note: it is quite rocky for the first twenty feet or so, so just carefully wade out a few feet and swim until the rocks clear or the water becomes deep enough. Off the bat, I’d say if you are at all afraid of heights, this hike is not for you. Try a waterfall hike instead, like one of these five. The hike itself only takes twenty minutes, but the path switches between thin dirt trails and mini rock climbs. Just for your information, these mini rock climbs do not actually require any sort of arm strength – think of them as tall, small steep steps. The hardest little rock climb section is actually the one right before the very top (and the worst part is, you can’t tell you’re almost at the top). That being said, DO NOT push yourself more than you feel comfortable. Take breaks when you need it (in the small areas of shade, if possible) and don’t be afraid to turn around, head back down, and enjoy the cool, refreshing Pacific Ocean instead. If you do choose to power through, the completely unobstructed view at the top of Chinaman’s Hat is absolutely stunning. On one side, there is the unending ocean with layers and layers of beautiful blues. On the other side, there is Oahu’s eastern coastline with the stunning, yet mysterious Koolau Mountains. I could’ve sat there for such a long time, but the tide was rising, so we were headed back down. If you do plan on doing this hike, bring a little snack with you (perhaps something from Part 1 or Part 2 of the Hawaii Food Bucket List, because you’ll work up quite the appetite between this and your journey over. On the rocks surrounding the little beach of Chinaman’s Hat, you’ll most likely be able to catch a glimpse of little crabs scuttling along. Trying to get a picture might prove a bit more difficult than anticipated. If crabs aren’t your thing, don’t worry. They won’t approach you unless you approach it. The island is also a Hawaii State Seabird Sanctuary. However, I did not see any birds while I was there. It’s been rumored that there are actually some sea caves on the coast of the island. I wasn’t able to spot any when I was there, but that would also make for quite the cool adventure. Does This Seem A Little Too Daunting? There Are Tours You Can Take! 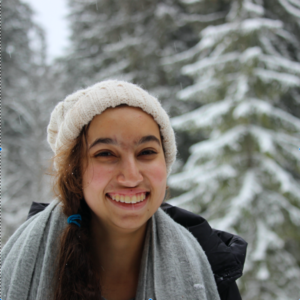 While I prefer to do more adventurous activities on my own as I like to choose how much time I spend doing each portion, tours can be a great option for some. 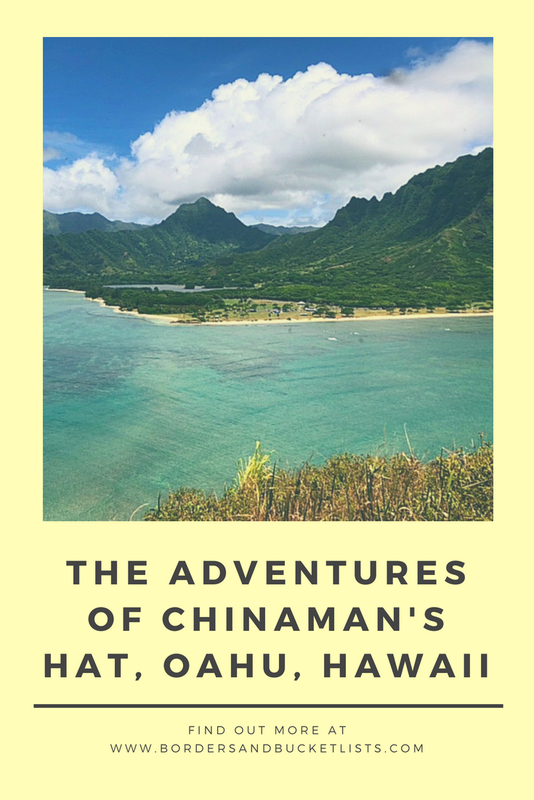 I’ve thrown out a lot of warnings throughout this post, so if it seems like too much, but you still want to check out Chinaman’s Hat, these tours can be the option for you! Active Oahu Tours offers a 1.5 hour tour for $80 per person. If you’re looking for one that includes transportation from Waikiki, check out Discover Hawaii Tours, which starts at $105 per person. Looking for more activities to do on your trip to Oahu? 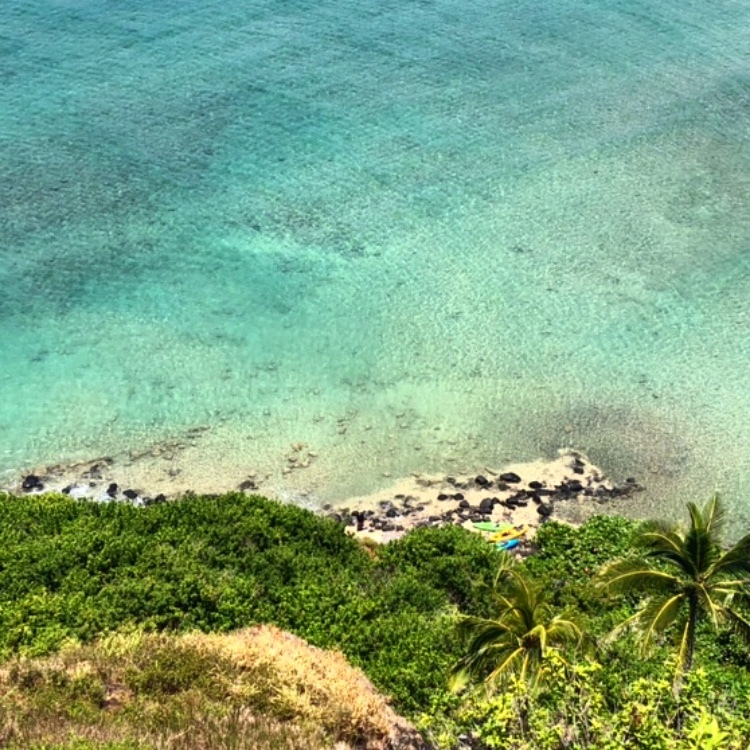 Here are some fantastic Oahu off-the-beaten-path ideas for you! Have you ever visited Chinaman’s Hat? What was your experience like? Write about it below in the comments! Excited about this new hidden Hawaii gem? Pin it for your next visit! Such a nice little hidden gem! Photos are gorgeous. You are quite the Hawaii expert! Aw thanks so much gal! That means a lot :). I don’t do the adventurous travel anymore, but I can still appreciate “going along” with people who do! Plus, I found the details in your post about safety, timing, options, so refreshing compared to most travel blogs! Good for you! Thanks so much! I think those are important tips for people to know. I definitely believe that most people who are unfamiliar with the ocean underestimate how dangerous it can be, so I don’t want anyone going in overconfident and hurting themselves. This makes me want to go back to Oahu so badly! I got to visit my friend a few times when she was going to school there, and I was always tempted to paddle out to the islands when we were at Lanikai Beach. Ooh that’s so fun! The paddle out to the mokes (that’s what we call those islands) from Lanikai Beach is actually a lot harder than this one, so be prepared! This looks like a fun day trip! My sister and I kayaked on Oahu, and she still swears we nearly died with high winds and waves! I love the idea of combining a hike with the kayak outing! Oh no!! I’m glad you guys made it out okay! This totally sounds like a place you would enjoy! Such a beautiful area and so many great outdoor activities. I would def do some paddle board or swimming! I love adventurous outings and this sounds like an awesome place! Getting off the beaten path is always high on my to-do as well. Thanks for all the great info, I’m surprised it’s not more popular! Me too! There’s just so much to do! I love the details and a little background story. Oahu is very new to me but in all honesty I would love to explore it all together. Oahu definitely has a ton to explore! I have done a very few hikes but this looks like a great day trip. Loved how you have described your experience. Of course! Glad you enjoyed the read! I know, neither did I until a few months ago!